Why Buffer is one of the most effective Social Media Management tool? While working with so many brands and companies to manage their Social Media platforms, I have come across a plethora of Social Media management tools and believe me every tool has its features, USPs and restrictions as well. I started using Buffer in mid 2011 and as the tag line says ‘A smarter way to share on Social Media’, it is actually one of the most efficient and smartest tool to share content on your social platforms. The best thing about Buffer is that it’s a very simple tool. All you need to do is connect one or more social networks, set up posting schedules that can be different for each network. As you add new content to your buffer and assign it to one or more of your connected networks, that content will be shared in the next available time slot. If you haven’t started with Buffer yet, just go to bufferapp.com and connect with the credentials of one of your social networks for a quick sign up. Once you are done with creating the account, connect all your other networks with it. Buffer allows to connect one Twitter profile, Facebook profile, LinkedIn profile or App.net account. The free account will only let you send 10 updates daily. To manage more than that, you need to sign up for a premium account which allows 12 connected networks and unlimited updates just for $10/month. In Social Media, it is very crucial for brands to update their posts at the ‘right time’ on any social platforms and this makes a lot of difference in the impact generated. As we know most of the small business owners face this challenge of how to make their online presence regular and consistent. Most business owners do not have the time to sit and think of the content that they need to publish on Facebook and Twitter every day. If your able to gauge the time when your brand gets maximum engagement, half of your efforts are already successful. Buffer helps in taking all this to the next level by providing an opportunity to set various time slots to update your posts, so that your posts get maximum visibility. So it makes your work as easy as- create, schedule and watch the magic. Buffer provides with very basic and relevant analytics which meets a brand’s need of the hour as its real-time. You will get metrics for Facebook comments and likes for every post, for Twitter it provides Retweets, Favorites, Replies and the Potential reach of that Tweet. As I mentioned, business owners may not get time to check and reply to the conversation that is happening on their content, brand or related topics; with Buffer they can also allow additional team members who can add to your buffer. Buffer also seamlessly integrates with your web experience. Whether you’re browsing the web or reading an article, Buffer button and browser extensions – available for Chrome, Firefox and Safari – putting content into the app’s queue and sharing it with a social network can be done with one click. 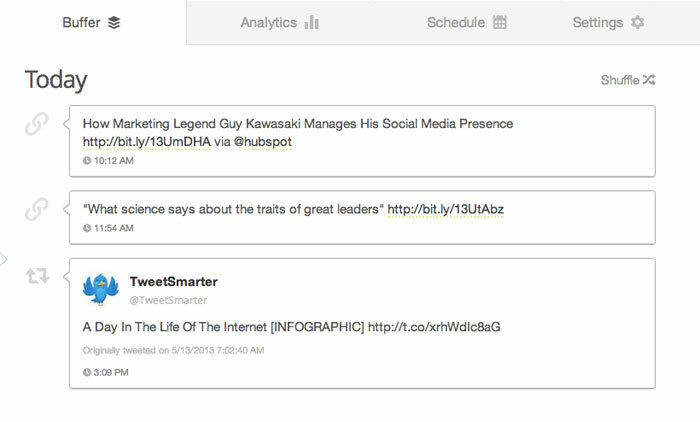 Recently Buffer has introduced a new feature which enables to schedule retweets with the browser extension. Which Social Media Management tool do you use for your brand? Tweetdeck or Hootsuite? Try Buffer, you might just love it the way I do.